The traditional capacity-planning process is fast becoming obsolete. An integrated health system that fails to invest in a next-generation capacity-planning tool will be unable to fully realize its own cost and quality advantage potential. How do health systems position themselves as first movers in this rapidly evolving environment? In this Executive Insights, we discuss the five core elements that should be part of a new capacity-planning tool for integrated health systems. Capacity planning is a core function of health systems; it is standard practice to develop a utilization driver-based projection of future health services demand and any resulting capacity needs. Such a forecast serves as the foundation for capital planning and deployment, driving health system decision-making around new inpatient and outpatient facilities, staff, and other investments. However, the traditional capacity-planning process is fast becoming obsolete. The capacity-planning function was conceived and designed when the healthcare delivery system itself consisted primarily of providers (including hospitals/health systems), with payers operating independently under fee-for-service reimbursement arrangements. This negated most of the economic incentive to consider how care delivery decisions impacted a payer’s cost position or total cost of care. Indeed, the goal of traditional capacity planning is often revenue maximization for the health system — of getting more “heads in beds.” As such, traditional capacity planning has at times fueled asset-heavy investment strategies focused on high-margin inpatient and specialty services, often compensated on a fee-for-service basis. However, the healthcare world is becoming increasingly integrated and value-oriented. Payers are acquiring providers, providers are starting their own health plans, and a growing share of provider revenue is being tied to performance metrics (both clinical and experiential) or is “going at risk” in some fashion. The integration of payer and provider assets, together with the shift to value-based reimbursement, is driving a new optimization equation for demand and capacity planning — one that must take into account the financial impact to both the health plan and health system. Kaiser, with its closed system — all KP patients are KP members — views its hospitals and facilities as cost centers, which somewhat simplifies its economic optimization equation. Integrated payers and providers in “nonclosed systems,” however, face a more complex challenge. They must meet cost-of-care reduction goals while maintaining the financial viability of their owned provider assets, which contract with other payers and often rely on the associated patient volume to break even or earn margin. Put another way, their optimization equation falls somewhere between a closed system and a stand-alone health system with no completely “captive” health plan or payer assets. 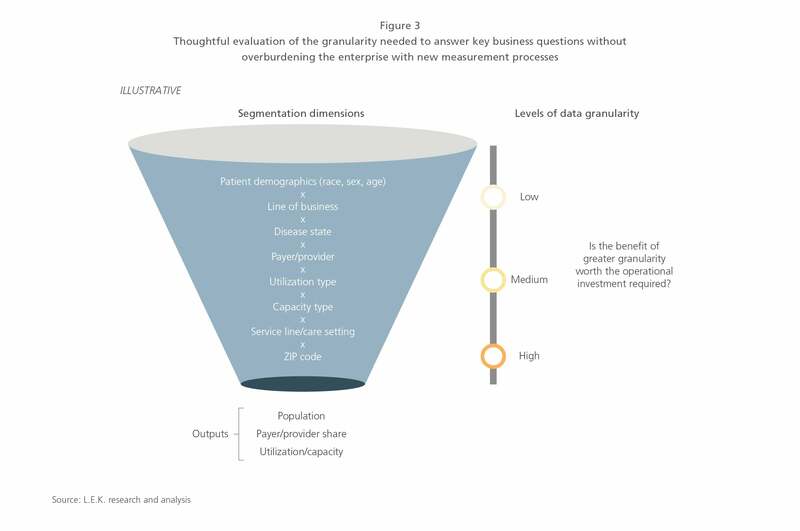 To optimize capital deployment, integrated payers and providers in nonclosed systems need deep visibility into how local market populations, competitive and regulatory trends, and internal and competitive strategic decisions impact demand, capacity needs and economics for the health plan, the health system and the organization as a whole. 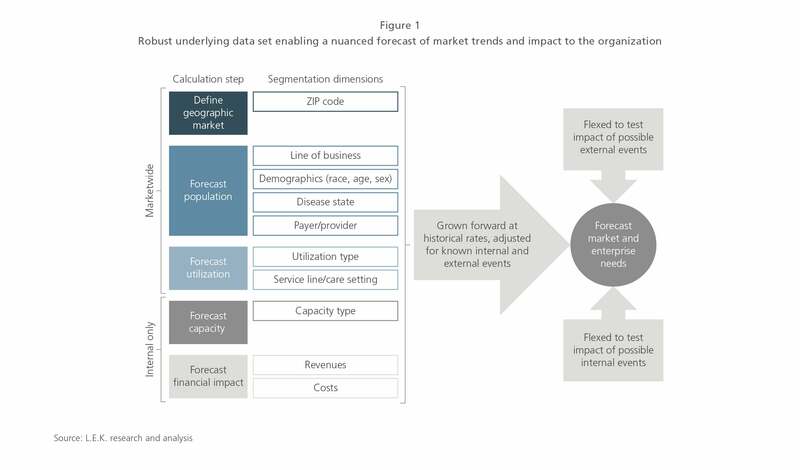 A tool that leverages external data along with internal data and analyses from all business units within the enterprise to form an aligned, future-looking view of the market and its impact will be critical to positioning any nonclosed integrated health system for success in this rapidly evolving environment. A new capacity-planning tool for effective integrated health system planning needs to have five core elements. 2. Alignment throughout the organization on a standard set of variable definitions. It is not uncommon for different lines of business or business units within the same integrated health plan or health system to define or measure utilization, capacity and cost differently. For example, while the health plan may use encounters to measure utilization, the health system may rely on discharge data in its electronic medical records. A successful, integrated capacity-planning tool must be grounded in aligned utilization, capacity, geography (see Figure 2), and cost definitions and measurements that can be used to facilitate aligned strategic planning. 4. A platform that enables automation. Today, many organizations run their capacity-planning tools in disparate Excel spreadsheets or in other similar platforms and file formats. These spreadsheets or analyses are often owned and maintained by individuals who serve as critical lynchpins to output. As a result of those two factors, the process to revise or update a capacity plan is labor-intensive, often taking days or weeks to pull in new data and rerun each composite analysis. A next-generation capacity-planning tool should sit on a centralized data warehouse of cleaned and aligned data sources, and should run on a centralized platform, such as Microsoft SQL Server Integration Services or Informatica, with automated processes to pull in data and generate outputs that support strategy planning. 5. Centralized and empowered model ownership. An integrated capacity-planning tool must be just that — integrated. It cannot sit in any one business unit but should be owned by the whole organization. That’s why a single individual who sits at the enterprise level and is empowered to drive alignment on data, definitions, analytical process and output should be given ownership of the model. Such an individual should be supported by functional subject matter experts who own the technical specifications around data, the platform and its architecture, as well as the business processes and inputs from, for example, financial planning and analysis, operations, and the organization’s strategic leaders. 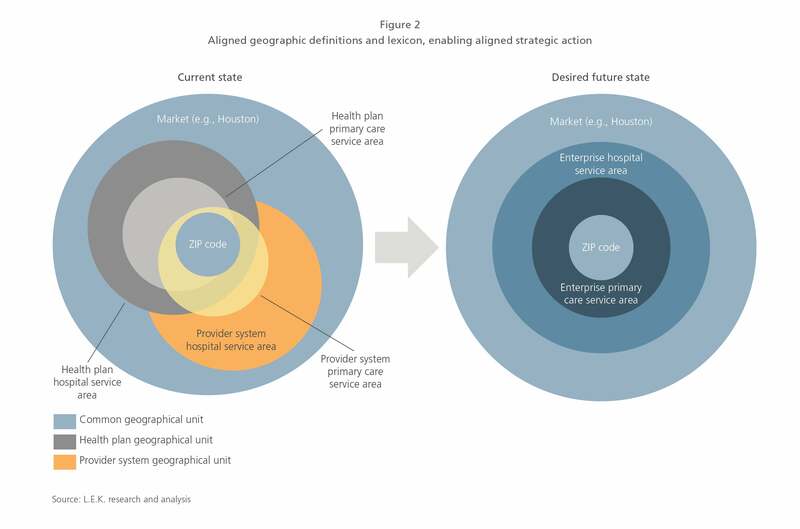 Retooling an integrated health plan or health system’s capacity-planning process will support the unified strategic planning that is needed to compete and win. It will provide visibility into the financial impact of known competitive, regulatory and strategic events on the health plan, the health system and the organization as a whole, and serve as a foundational tool for scenario planning. For example, consider the following scenario: Your organization learns that a competitive health system, currently out of network for the organization’s health plan, is going to build an outpatient multispecialty office in a strategically important geographic area. An integrated capacity-planning tool would estimate the impact that this event would have on health plan enrollment, health system volume and any related capacity needs, as well as on the health plan and health system’s finances. It would enable scenario testing of the impact of potential organizational responses, such as bringing the health system in network or building your own multispecialty office. Ultimately, it would assist the organization in planning for an altered future market state. An integrated health plan or health system that fails to invest in a next-generation integrated capacity-planning tool will be unable to fully realize its own cost and quality advantage potential. Organizations that rely on a less comprehensive data set and an outdated planning tool run the risk of critical miscalculations, such as overbuilding provider capacity or underestimating provider network needs to support a low-cost health plan product. To date, few organizations have embarked on this process; first movers are likely to garner significant competitive advantage. The time to position your organization for success with a next-generation integrated capacity-planning tool is now.